I'm loving my herb garden right now. July is its most magnificent month, and all the hard work that has gone into it shows. I created it oh, about 9 years ago. I sited it in an odd part of the farm, a place that doesn't get an awful lot of sun. Most herbs don't need all day sun, like most vegetables do. We're not really looking for them to flower, so less sunlight fills that bill. It's in the shape of a circle, about 24 feet in diameter, and I cut it into pie wedges, twelve of them. Then I bisected each pie wedge so that it really is two circles, one inside the other. That gives me 24 different spots in which to plant herbs. 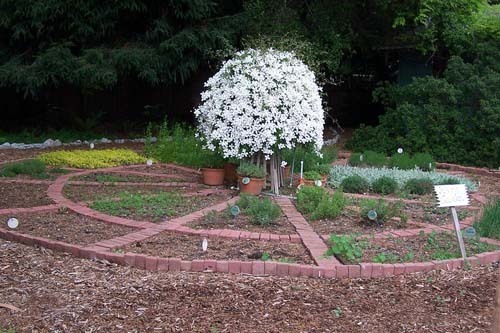 Here is a picture of the herb circle during the winter, when most things are dormant. That gorgeous specimen in the middle is a Clematis Montana putting on its annual show. We changed the herb garden slightly this year. The chef was not loving the various sages I originally planted so long ago, and he had no use for a few of the other oddities I had in there, such as St. John's Wort, Germander, and Lamb's Ear. So we dug those out this spring and added some new herbs that I've never grown before, but they're coming along nicely: Chervil, Safflower, Anise Hyssop, German Sour Dock, and Fenugreek. The newbies have been added to our tried and true favorites: Stevia, Rosemary, Oregano, Bronze Fennel, Basil, Chives, Lavender, Parsley, Thyme, Summer and Winter Savory, Golden Marjoram, Garlic Chives, Dill, Purslane, Cilantro (he loves the flowers and the green coriander seeds), Sorrel, Yarrow, Tarragon, and the bully, Nasturtium. The Nasturtiums are always trying to dominate the others, overshadowing (literally) the basil and chives next to them. I get in there and hack away at the invading army, and try to revive the squashed neighbors. I do love the Nasturtiums, though, they remind me of my grandmother, who had a small patch of them growing under the stairwell of her apartment. I insisted on going out there and watering them with her little watering can. So much so, that she'd eventually have to call me in, saying, "That's enough, sweetie." They were the first plant I ever nurtured. So I see Nasturtiums as not only a reminder of my grandma, but of the start of the obsession I have with plants. I'd love to be able to show this herb garden to my grannie. I think she would have loved it. When I re-open the farm to the public soon, you're all invited to come over and take a look at it. Bring your watering can. Diane: You can trap moles with a cinch trap. They have a mole version. You can learn how to set it on youtube. Good luck! 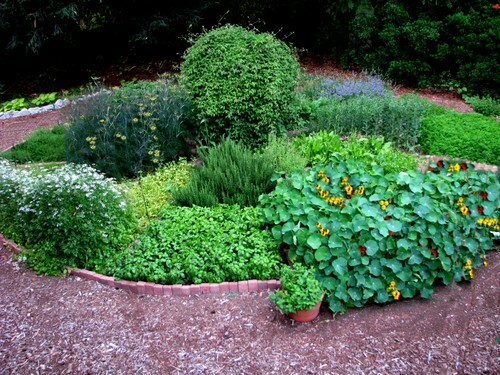 I loved the picture of the herb garden, and I am aspiring to plant one my self. but what do you do about MOLES? They are stealing my plants right from under. Any one have any suggestions. I would like to know how to stop them before i design my herb garden. HELP!!!!!!!!!!!!! Thanks for providing the details (size, specific herbs) so we can know what to aim for! Looks super-cool. You know you're super cool. . .
Look at what a little sunshine and water can do! I love that I can hear your voice when I read your writing, Cynthia. I hope you are feeling better, and I will come and visit soon. This week maybe? With the magic lentils? What a wonderful herb garden! I bet it smells divine when the sun is shining! Cynthia, when do you plan to open your farm to the public so we can visit? I am really looking forward to it. I tried driving through your town on this last July 4th weekend in order to take a peek at your farm even from afar, but couldn't find it even with a GPS. But It is very lovely town you are in! OHH, it looks gorgeous. I can't believe how much it has filled in since we visited a couple months ago. Resident Gardener here now has lots of ideas for herbs to add to our garden. Nate: Anise hyssop is easy to grow from seed. I started it in flats in the greenhouse in later winter, pricked them out into 2 inch containers, and put them in the herb garden in May. They are tall and lovely now. I've been picking the leaves for the chef. Clair, your question prompted me to find an old picture of the Clematis Montana blooming in the herb circle, and adding on the paragraph about that. It's quite spectacular. Just gorgeous! What's that big, upright plant in the middle? Do you also sell your herbs? Oh, nasturtiums are totally a Granny plant for me too! I can remember visiting her as a kiddo and being so amazing by the fact that she would let me pick the flowers and put them in the salad for EATING! I still eat the flowers every chance I get; they are especially tasty in pesto. 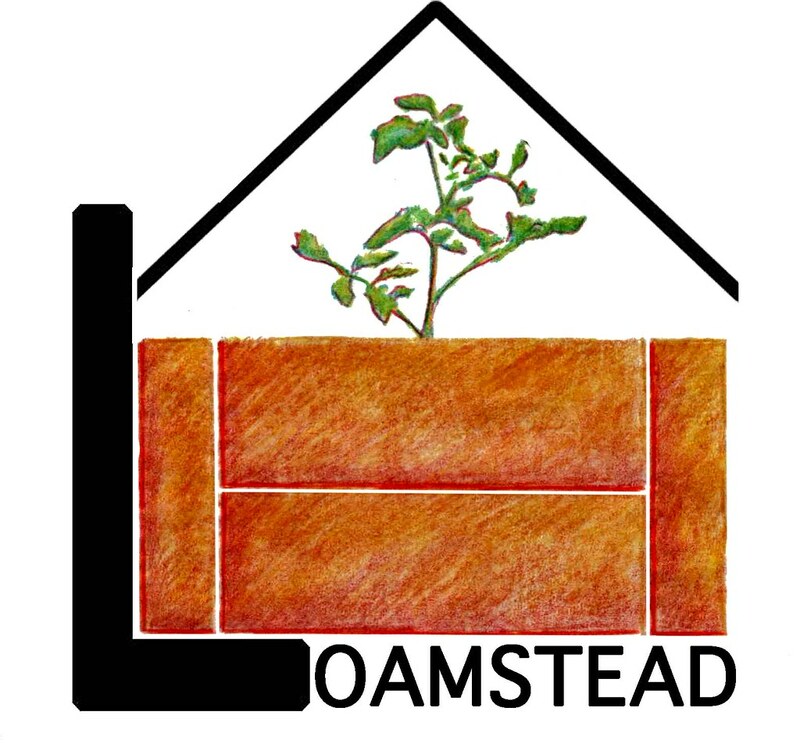 I also wanted to drop in and say that I followed your tomato planting guide this year, down to the worm casting and aspirin tea applications, and my plants look *so* great - they are disease and bug free and just loaded with ripening fruit. I've passed it along to anyone who will listen: thank you !!!!! I remember what a lovely herb circle you had when we visited the last time you had a tomato tasting party. I could just wander, touch, smell, and nibble (small confession here!) to my heart's delight. I've been meaning to grow anise hyssop as a butterfly attracting plant. How well does it do for you?